VIDEO NASTIES: Censorship Is The Truest Of Horrors – Schlockmania! To an American citizen, the idea of having the government censor your choice of horror films is hard to imagine. However, that was a true-life horror that British genre fans know all too well. In the early ’80s, England lived through a trumped-up “moral panic” that saw moral watchdogs, hack journalists and overambitious politicians teaming up to ban and eventually edit a series of horror and exploitation films on home video. 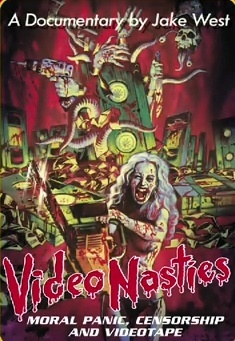 The tabloid epithet for the films in question was “video nasties” – and a documentary of the same name explores how this surreal series of events was more horrifying and unbelievable that many of the films that were being censored. Video Nasties tells the complex and colorful tale of the titular scandal/phenomenon in just under 75 minutes. The early scenes reveal how the VHS revolution unleashed a tidal wave of luridly promoted horror and exploitation into video stores. 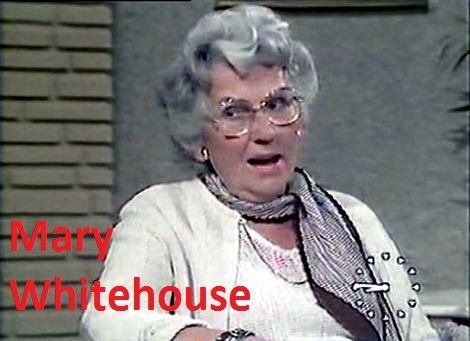 However, the in-your-face methods of promotion backfired, arousing the ire of bluenose media watchdogs like the infamous Mary Whitehouse. She had a lot of pull with journalists and politicians, which led to a series of sensationalized news stories, video confiscations, arrests for an unlucky few and ultimately a law that allowed home video to come under the same BBFC censorship as theatrical releases. The resulting documentary is equal parts exposé and black comedy. Director Jake West weaves together numerous interviews into a compelling oral history. Some of the most interesting commentators are Geoffrey Robertson, a civil rights lawyer who defended some of the prosecuted video dealers, and Martin Bright, one of the few journalists who had the courage to speak up in favor of freedom of choice. Their tales illustrate how the real the risks were to those involved in this controversy and reveal how the “moral panic” angle was really a way for newspapers to sell more copies and politicians to disguise their real failings. There are also witty observations from a variety of genre scholars, with Kim Newman and Stephen Thrower offering some of the best insights about both fly-by-night video dealer practices and the domineering nature of the censors. It’s interesting to note that Video Nasties also allows participants from the pro-banning side have their say: the top interviewees from that side of the aisle are Graham Bright, who authored the anti-video nasty law, and Peter Kruger, a Scotland Yard officer who presided over the confiscation and cataloguing of the video nasty titles. To his credit, West never tries to make either of these men appear like a villain: instead, their wrong-headed rhetoric and patronizing attitudes do that job for the filmmakers. Video Nasties is also interesting because it reveals details that even devoted followers of this saga might not know. For instance, the video nasties list was not the creation of the BBFC: despite that long-standing rumor, the list was created by law enforcement well before the BBFC was involved. Also, the presence of Bright allows him to reveal the tricky parliamentary rules and procedures that allowed the law he penned to be rushed into action so quickly. You’ll also discover an ironic oversight made during this rush that seems darkly humorous in hindsight (won’t spoil it here, see the documentary to find out). The credit for a lot of this detail should go to Marc Morris, who produced and also served as chief researcher on this film. Finally, it’s worth mentioning that Video Nasties never succumbs to talking-head dullness despite its interview-driven nature. For starters, West edited his film well, pacing it breathlessly and making excellent use of t.v. footage and film clips to provide a sense of visual variety. Sometimes, the use of clips is uniquely inspired: for instance Bright’s musings a bout how some video nasties might have included real violence is followed by a cheeky clip from the trailer for Snuff. That said, the best editing in this documentary might be a wild barrage of shocking clips at the start of the film that covers every film on the video nasties list, set to the tune of “Nasty” by the Damned. In short, Video Nasties chronicles an important part of horror history in a fast-paced entertaining way while also providing a timely reminder of how extreme art can be scapegoated by the ambitious and ignorant. If you value the wild side of horror, this is something you need to see. NastiesTrailer from Severin Films on Vimeo.